Day 4 of November sneak peeks! Last day of sneak peeks and less than 24 hours until you can get your hands on all these fabulous sets! This set is free with a $50 order! Doesn't this little mouse just look adorable all snuggled down waiting for Christmas morning? Our other Designers that are featuring samples on their blogs for Mouse Dreams November 2009 SOM are: Katie, Tricia, Nancy, Sarah, Tori, Candy and Laurie. (links on left sidebar). I love stamping up my own tags for Christmas! This little set will help you to do that! Stamp these on Avery labels 8160 and you are ready to label all your Christmas packages! So simple and easy! Our other Designers that are featuring samples on their blogs for Gift Labels are: Katie, Cassie, Tori, Candy and Laurie. (links on left sidebar). Perfect for tags this Christmas and Thanksgiving Season! Our other Designers that are featuring samples on their blogs for Acts 20:25 are: Linda A, Tricia, Sarah and Candy. (links on left sidebar). Go to the Idea Gallery for these stamp sets! Tomorrow begins the Great Candy Caper! Did you guess that it is Clear Dollar Stamps birthday? You are correct! Tomorrow we will begin the party with 5 great days of games, prizes, and fun! See you there! Day 3 of November sneak peeks! Day three of November sneak peeks! This set has some fabulous quotes! As all of us know that have kids, they are the greatest learning experience we will ever undergo! This set is perfect for cards and especially scrapbook pages! Our other Designers that are featuring samples on their blogs for Welcome to Parenthood are: Kim, Angela, Katie, Nancy and Candy. (links on left sidebar). These little scriptures are perfect for the inside or back of your cards as well as the fronts! Our other Designers that are featuring samples on their blogs for Mini Christmas Scriptures are: Linda A, Tricia, Sarah, Stacy, Candy and Laurie. (links on left sidebar). I know we have a lot of cat lovers in our midst....I think you will love this little set! Isn't this the cutest gift card holder! Our other Designers that are featuring samples on their blogs for Meowy Christmas are: Trudy, Tricia, Cassie, Stacy, Shawne, Candy and Laurie. (links on left sidebar). I am one of those people who really likes snow. Crazy, I know, but I really do! I love building snowmen and going sledding! I will be able to use this set on all our sledding scrapbook pages! Our other Designers that are featuring samples on their blogs for Just Chillin' are: Angela, Trudy, Nancy, Tori, Wendy and Candy. (links on left sidebar). The Great Candy Caper is coming November 1st! Why are we having a Great Candy Caper? We are celebrating something.....does anyone know what that would be? For 5 days, we will be giving away 5 prizes, to 5 people each day, to celebrate 5 years of????? See you tomorrow for day 4 of sneak peeks! Day 2 of November sneak peeks! Let day 2 of sneak peeks begin! Oh, I just love this set. I love bright colors and you will see in the samples for this set, everyone else thought that was a great idea too! This set is perfect for cards and would be adorable on a Christmas scrapbook page! Our other Designers that are featuring samples on their blogs for Jolly Joy are: Angela, Trudy, Cassie, Tori, Shawne, Candy and Laurie. (links on left sidebar). The Holidays: a time for families to gather, friends to express what we are thankful for, and all of us to celebrate the Birth of our Savior. Many times, as we gather, we need a little something special to take to our hostess, gifts for exchanges, and just a little something to spread holiday cheer......which leads us all to our kitchens! This little tag set will help you add that little special touch to your gifts this holiday season! Katie made up a bunch of little tags to tie on to her goodies! Candy made a little box for her baked goods....or store bought candies when we run out of time! Don't forget to wrap them with some little handstamped labels! Our other Designers that are featuring samples on their blogs for Baked for You Tags are: Angela, Trudy, Katie, Cassie, Candy and Laurie. (links on left sidebar). Charlie and Charliene are all dressed up for their church Christmas play. What a wonderful way to spread the news! Perfect for your scrapbook pages of your kids in their plays! Christmas cards made with this set are sure to draw a smile! As you can see, Candy had a great idea....little ornaments! Wouldn't this be a perfect craft for kids at home or at church? Our other Designers that are featuring samples on their blogs for Charlie Nativity are: Angela, Cassie, Stacy, Wendy, Candy and Laurie. (links on left sidebar). Customer request number three for November! We have had many requests for carolers, so here you are! We hope you love them! Candy made a little candy box. Wouldn't that be fun to make some of these to hand out as you go caroling this year? A great treat for those in a nursing home! Our other Designers that are featuring samples on their blogs for Billy & Maggie Carolers are: Katie, Linda A, Sarah, Wendy and Candy. (links on left sidebar). Value Verse for November! Remember our value verses are sold at 20% off all the time! Our other Designers that are featuring samples on their blogs for Philippians 4:6-7 are: Tricia, Nancy, Cassie, Stacy, Candy and Laurie. (links on left sidebar). The Great Candy Caper is coming Sunday the first of November! What is the Great Candy Caper? Keep checking back....we will be telling you a little more each day! I can tell you that the Candy part of the caper is does mean blog candy....and lots of it! See you tomorrow for day three of sneak peeks! Let the sneak peaks begin! It's time for sneak peeks again! Now that all the fall parties are just about over, we can start thinking about all of the wonderful Christmas cards and presents that we can create to share with our loved ones! Isn't this the cutest little set? Perfect to stamp up some quick, cute, and easy projects! Our other Designers that are featuring samples on their blogs for Holiday Patterns are: Katie, Linda A, Nancy, Sarah, Candy and Laurie. (links on left sidebar). Here is another customer request! We have trains to color and quick train silhouettes for every train lover in your life. What boy, young or old, doesn't love trains! Our other Designers that are featuring samples on their blogs for Railroad Memories are: Linda A, Tricia, Nancy, Cassie, Stacy, Candy and Laurie. (links on left sidebar). I just love, love, love this little Patchpal Reindeer! Perfect for all the kids you need to send cards to...and why not make a little mini kids coloring book as a gift with this set? I know my kids would love it! Our other Designers that are featuring samples on their blogs for Patchpal Reindeer are: Trudy, Katie, Sarah, Cassie, Shawne, Candy and Laurie. (links on left sidebar). Customer request number two for the month! I can't wait to make a "You are a Fossil" birthday card for both of my best friends this year. Luckily, I am the youngest of us all! Our other Designers that are featuring samples on their blogs for Dinomite are: Linda A, Tricia, Tori, Stacy and Candy. (links on left sidebar). Oh my! My girls are going to love the cards I can make them with this set! I may even make them some little paper dogs sets to play with when they are sitting and bored! You must look at all the samples for this set...they are adorable! Our other Designers that are featuring samples on their blogs for Dog Days Celebrations are: Kim, Angela, Katie, Sarah and Candy. (links on left sidebar). Hi friends, its Katie here and its another Tuesday here at Clearly iStamp. If you haven't figured it out yet, I'm a huge fan of embossing techniques and today's card is just another example of this. With this tutorial, I am using your basic cardstock, a brayer, ink pad, embossing powder and Pansy the February Flower of the Month as well as the stamp set called Tea-rrific. What I love is the fact that I used the pansy image that I would normally consider an "alone" image, but I really loved the look of it as a background stamp. To me it created a lovely "romantic" background. So lets get going with all the embossing. Often times we use cards using glossy cardstock or white cardstock as a base, but today's card is using colored cardstock. I'm using a lighter shade and this is the color I want to show through in the end. I do have a hint for you. Don't feel like you have to stamp your entire sheet and then put your embossing powder over it because in all honestly, the versamark can be difficult to see. Instead, stamp one or two images and then lay the embossing powder down, stamp again, and then add more embossing powder to the new image. This allows me to see what my pattern is looking like and where to stamp next. After I have it all embossed, then I lay my cardstock down and get my brayer out. Ink up the brayer and roll away. I opted to use a deeper purple compared to the light lavender I used as my base. Take a sponge or tissue and wipe any excess away from the embossed images. Here is a side by side with the end result and the light lavender base piece. I decided to use the tea pot from the above mentioned set and wanted to cut it out with my circle nestability. I then wwanted to emboss it. Here is a close up of the background piece. Before you get going though... I have a tidbit for you....this is all I'm going to say, but you MUST be here all this week of course because of sneak peeks, but you REALLY MUST, MUST be here November 1st. I promise it will be fun for YOU! Thanks for visiting as always! Hi friends, its Katie here to welcome you to another Friday. Today I'm attempting to give you my take on the ruler/measurement and how I usually mat my stamped images. This is what I do and of course if you do something else that works for you we'd love to read about it. There are cutting tools out there that help you create perfect mats, but I have no experience with them and just knowing that there are systems out there is the extent of my knowledge. I use either nestabilites, a straight blade (exacto knife) and ruler, my paper cutter, or often times a combination of all of them. So basically, I start with 2 ways of stamping my image. I cut a piece either square or rectangle to a specific measurement and work especially hard to make sure my image is even and straight. The image below is one that I cut with my rectangle nestability so I know that it is nice and straight and even. Often, I don't use the next nestability size, but cut my own mat with a ruler and blade. I find a piece of cardstock that is cut straight and I match up the top and side edge, that way I'm only responsible for cutting 2 straight edges. I also use a metal ruler - upside down. I can't nick the edge and it gives me the straightest cut. I have a 12" and a 6". The 6" works perfect for cards and they are readily available just about everywhere. I completely eye-ball this and I might not have the exact perfect measurement, but I can guarantee that my cuts are smooth and clean. Now here is the trick though. You can see that I've placed my index finger on the image. I've already started my cut and as soon as I get about 1/4 to 1/2 way down I hold on to the piece being cut away. This is to ensure that the cut stays straight and the pieces stay together. If you don't do this then that very last section will shift on you. To me from the picture it appears that my left side is slightly wider, but I think its the picture and even if it is, once its on the card it will be barely noticeable. One more mat to cut and I do it the same way. It doesn't have to be the same distance as the first mat either. If I need to trim off just a little bit, same thing.... I just eye ball it and slice away. If it happens to be crooked, then this ruler works wonders to keep a straight edge but vary the width of the cut if necessary. Now here is the other method I use to cut my images. I will cut a piece of cardstock to a specified measurement. It doesn't matter what it is as long as its a specific measurement. I do this so then I can create my mats to a specific size larger than my image. But lets start with the ruler and measurement. I must admit that when I start getting down there to the little lines, I do the counting to make sure I've got the right one because it is easy to get flubbed up. Its key to count whatever line you are looking at. For example, we'll start with the hardest which is the 1/16th increment. When you are counting 1/16's you will count every single line tall and short starting at the 1st smallest line and counting all the way until you get to 16 out of 16 and you've just counted 1". For the 1/8" marks you only count those lines and the ones that are longer, same for the 1/4" lines - only those and the longer lines. Another thing to remember when you are matting is that if you have a basic piece that measures 4 1/4" x 3 3/8" if you increase your measurement by 1/4" on both length and width your border will actually only be 1/8" wider on all 4 sides. The piece below was cut 1/8" larger. So if my piece measures 4 x 4 then my mat would measure 4 1/8 x 4 1/8, but my border would be a scant 1/16". This first card (in picture below) was matted with the straight edge and knife, but I used my paper cutter to create the orange and pink layers. I decreased each mat by a 1/4". Card measures 4 1/4" x 5 1/2"
Orange layer measures 4" x 5 1/4"
Pink layer measures 3 3/4" x 5"
When you are creating simple and very clean cards matting is a great way to go. My next card uses very similar measurements, but in 1/8" increments and I used a patterned piece instead. Again, when going for simple and very clean cards less is more. Change up your matting dimensions to get different looks. Have fun, but keep it simple to start. Thanks for hanging with us here at Clearly iStamp and I hope you have a great Friday and a great weekend. Hi friends! Its Katie here to welcome you to another Tuesday and hoping that you are having a great start to your week. We are cold and wet here in the Pacific Northwest, but from what I've read its pretty wet everywhere. Anyway, all this dreariness does make me think hard that the holidays are just around the corner... for me, whenever October hits it is just a whirlwind of activities. Anyway, today I've got a card set and carrier to share with you. I think this is one of those great little gifts to keep on hand or a great little set to have at a craft show. Cards are a hard thing at craft shows and I've heard both that they sell really well or they are complete bombs. It really depends on many factors. So here we go. I opted to make smaller notecards measuring 4 7/8" x 3 1/2" also known as 4Bar size. These are a great size just to write a little note and fun for decorating, but they aren't so small that you can't drop them in the mail. I made simple cards using an October stamp release called Christmas Blessings. Here is a little quickie guide if you want to cut your own 4bar sized cards. If not, these are available at paper stores. I haven't seen these at my Michaels or Jo-Anns but they are at a store called PaperZone here locally. I used the Neenah Solar White cardstock and opted to create my crease first with my scor-pal. I wanted my cards to be a side fold so I needed my score mark to be at 4 7/8". Fold to create side crease. One side will be longer than the other. Put into a paper cutter and cut off excess. Now flip so that your fold is at top and cut at 3 1/2". You will get 2 cards from an 8 1/2 x 11 sheet. For my cards, I cut a red base and then used the Moroccan Screen embossing folder to create a beautiful background. I love these embossing folders because they create such a presence with such little effort. I then stamped my sentiment with Versamark and used silver embossing powder for the the sentiment and the edges of my piece of cardstock. Now for the card case. You will need a piece of cardstock measuring 7 1/2" x 11"
Flip your cardstock and score as in picture below. Snip the partial score marks. Now, I wanted to create a window for the front so my card design will show through. I opted to use the Curved Rectangles nestabilities. Fold in your flaps and run through your die cut machine. I wanted to create a frame for the outside so I layered the die cut I used for my window and the next size up. Adhere with tape to keep the dies in place. Glue your frame in place, add adhesive to your tabs. I used the 1/2" scor-tape. Don't forget to add a piece of acetate to the inside of the window. Fold up and go. One last step is to create a notch towards the top and this is to catch your ribbon and hold it in place. Any small circle punch will work. I used the SU! ribbon punch. Add your cards and envelopes and there you go. Thanks so much for coming to visit and I wish a very happy Tuesday! This is Katie signing off for Clearly i Stamp. Happy Friday! Its Katie here to welcome you to another day at Clearly iStamp. Well, I love ribbon and I cannot lie. I have too many colors and kinds to count and you know what? I would buy, borrow, and steal even more whenever I could. But... there are times that I want to do something to ribbon just for fun, because it is fun and neat to change something to something else or realistically, I want to match something that I don't have right on hand. Today's tutorial is a technique and its all about dying ribbon and in today's case some crocheted flowers. Take a look at what and how I did mine. I picked some random ribbons, they are all varied in color and type. All you need is some reinkers of your choice and water. The amount of reinker and water are going to be variable and it will really be best to do a test sample as well. I started with 5 or 6 drops of the reinker and then added some water. The jar I used can be found HERE and I found that these were a great size to use. Add your ribbon... I decided to add more reinker after the picture above was taken. I used a pair of tweezers to just maneuver the piece of ribbon around. I used some grosgrain edged satin (white) in the picture. Here are some examples of the ribbons I used. This is the velvet ricrac... You can see that the pink can subtly still be seen. Here are the flowers. The originals are all on top and you can see the difference between the amount of reinker used. Now check this out.... the picture ABOVE was taken when the flowers were still damp, but the picture BELOW was taken when the flowers were dry. Just interesting... I didn't know that this would happen. Now there is also another way of coloring ribbon and this works for sheer ribbon, but can get kind of messy. All you need is your ink pad and a glove or in my case a wrapped finger. It works best if you can hold the ink pad with your hand while pulling the ribbon with your other hand. And the result... but make sure you set your ribbon to dry... it does take a bit. For my card, I opted to use a chocolate brown reinker and the satin grosgrain... I LOVE this ribbon!!! I just swirled my dye so it absorbed into the ribbon. This ribbon just sucked it right up. And my card using this piece of ribbon. I opted for a non traditional holiday greeting card. I used another October release set called Christmas Scriptures and some Basic Grey Porcelain. And one more using the dyed crocheted flowers. I used a stamp from the set called Elegant Flourishes and the sentiment is from a set called Soil of Prayer. Well, that's it for me today... and I hope you have a wonderful Friday and a great weekend. Hi friends! Its Katie here to welcome you to another Tuesday. Today, I'm focusing on a product that Lori has available at Clear Dollar Stamps that I LOVE and USE, not necessarily every day, but EVERY time I use embossing powders and/or glitter and anything else that is made of a fine consistency like the fore mentioned. This Glitter "Clean Up Cloth" is brought to you by the lovely Diana Crick of Scor-pal fame. I've been lucky enough to meet her and she is truly lovely and not only that she has produced some great products that WORK! The picture below is after I've unfolded the initial fold. The first thing you'll notice when you touch the glitter cloth is that it is slightly tacky, very similar to tack cloth. Its not a residue that will stay on your fingers or anything, but it is there. Secondly, you'll notice that it also resembles cheese cloth for those of you that are familiar with that. Keep on unfolding. This stuff is very sturdy, but fine as well so it might take a little bit of picking to get your edges going. Just keep pulling it apart... it won't rip. Notice how tight it is. So this (below) is what it looks like after that last "unfold". This last unfold will start in the center and will fold out to the right and to the left. This is your final cloth measuring approximately 18" x 36". The instructions suggest cutting it into 4 sections, but for my own personal use I cut it into 8 sections consisting of 4 cubes (using the existing fold lines) as seen in the photo below. Now how about seeing it in action. I decided to create a card that used both embossing and eventually glitter, but check out the embossing powder that was left over (lol)... and clearly, I'm normally much neater but for today's purposes I left a lot on the table. So I stamped my image on watercolor paper because I'm going to use tombow markers (098-avocado, 249-hunter green, 676-royal purple) and a waterbrush. As I'm putting the powder away, I've left a mess. Also, another note here. I normally work on a self-healing mat and clean up is very smooth, but the table I'm using for the photos has a textured surface (table from Costco). Place cloth right on top and swipe away. And after... you can actually see the outline of my hand where I swipe. Now obviously you have to take my word for it since you can't actually see it in action, but once the powder is on the cloth, it doesn't leave the cloth. Shake and it stays. Now time for the glitter (Martha Stewart). At this point, I've stamped, colored, and its time to add accents of the glitter where I wanted. To do this, I used my very favorite Quickie Glue Pen for my border on my cardstock mat and for my stamped image. There is a lot of life in this particular piece of cloth. Imagine, I've got 7 more sections to use. These are not reusable and are not washable. Once you start cleaning up powders and glitters and it doesn't stay on the cloth, throw away and start with a fresh piece. Now, I can't possibly let the post go by without showing you what I created in my non messy area too :) I used one of the new release stamps from October that is part of the Flower of the Month Series... the pansy. I made it into a birthday card so I grabbed a sentiment from another fabulous set called Ageless Antiques. I used some Basic Grey Porcelain for my designer paper and used the Textile Texture embossing folder to emboss on it. Then I used some distressing inks to add some age to it. I used a rectangle nestability to outline my frame around my pansies and then used a blade, ruler, and scissors to cut my flower out. For the mat, I also used the nestability to cut and then emboss (click here for more info about this process) and then used my quickie glue pen to apply glue and then glitter to the edges of my cardstock and stamped flowers. That's it for me today and if you don't have a glitter clean up cloth... definitely think about picking one up. It is well worth the cost and does what its supposed to do! Thanks for stopping by and spending time here with Clear Dollar Stamps. Look who our Clear Dollar Stamps' featured friend is for October! We found her easily because of her participation in the CDS weekly color challenge group at PCP. We think Pamela adds a lot of heartfelt style to her designs! We want you to get to know Pamela too, here are a few questions we asked her. How and when did you discover stamping? About 2-3 years ago. I had been doing some scrapbooking with using stamps when my niece introduced me to a Stampin' Up workshop. Once I was taught not to be scared of a rubber stamp the rest was history! How would you describe your stamping style? I couldn't even begin to describe it...LOL...maybe heartfelt??? I just go with what I feel the person who is the recipient will like. Maybe, you can enlighten me on my style. I like that...style...never knew I had any! When did you discover Clear Dollar Stamps? Not soon enough!! Sure do wish Lori offered stock in the company! 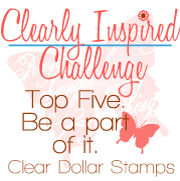 What do you like best about Clear Dollar Stamps? E...all of the above! LOL The price, service rocks, their CLEAR, and they hold that INK!!! Do you have any other hobbies other than stamping? Only when I am not stamping...sewing,beading (I make beaded wind chimes out of old bed springs), woodwork (I make yard art for myself and family & friends),and in the process of learning to weld! Lori and Laurie...Thank you both so much for choosing me this month!!! I am total shock, happiness, excited, awe, and overwhelmed!!! Thank you, thank you, thank you! And now we want to show you some of Pamela's creations using Clear Dollar Stamps! We hope you enjoyed this months Featured Friend and keep on creating, because we are already searching for next month and future months friends! Thank you so much Pamela for allowing us to feature you on our blog! Your designs are so whimsical and fun and we sure enjoy seeing what you create! Until next month, we hope your days are filled with blessings and stamping galore!